The Virtual HR Center uses a pop-up box to take the assessment in. If you have pop-up blocker(s) installed you will need to disable them in order to take an assessment. Individualized instructions for turning off most pop-up blockers in use are listed on this page. 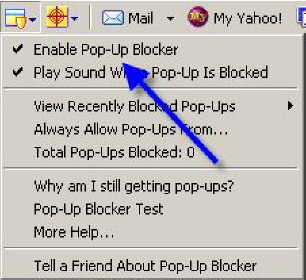 Bear in mind that if you have multiple pop-up blockers you will need to go through each one and disable every one. Even if a Toolbar is not being displayed, most of them will still block the pop-up. Some of the pop-up blockers will allow the user to open a pop-up window by holding down the Ctrl key while clicking the button. Click here for a list of pop-up blockers that have instructions on how to disable them shown on this page. To know if you have toolbars that are not displayed, click View then highlight Toolbars. This should bring up a menu similar to the one shown here. If there is something listed that does not have a checkmark next to it, all you need to do to make it visible is click on it. Unfortunately, if you have multiple unlisted items clicking on it will also close the box so you will need to once again click View then highlight Toolbars to bring the toolbars menu up again. Repeat this step as often as neccessary until all toolbars are visible. (you can turn them off later when you are finished with your assessment). Go through each one and turn off the pop-up blocker. If you have Norton Internet Security remember that the last step after turning off Norton Internet Security's pop-up blocker is to to either delete your Cache or to Refresh the assessment page while simultaneously holding down the Ctrl & Shift keys to open a non-cached copy of the assessment page. Google Chrome blocka pop-ups from showing up automatically. If you have upgraded to a newer version of Google Chrome then click this link. However, if you have an older version of Google Chrome then follow the instructions below. If you have an older version of Google Chrome, you can choose whether you want to see pop-up notifications. Choosing to see these notifications allows the user to open the desired pop-up and still leaves all other pop-ups blocked. If you want to see pop-ups, select the 'Notify me when a pop-up is blocked' checkbox. If you allow pop-up notifications, an alert will come up at the bottom right-hand corner of the browser window whenever there are pop-ups for the page you're on. Click the alert to expand the pop-up and display the assessment. Newer versions of Google Chrome allow you to turn off the pop-up blocker or to leave it on and allow some sites to have pop-ups. Select Options This will open a new browser tab..
Click the Under the Hood tab. .
At the very top it says Privacy next to that is a button labeled "Content settings...", click this button. Scroll down to where it says Pop-ups and click the button labeled "Manage exceptions...". Enter the url www.virtualhrcenter.com into the textbox while leaving the adjacent dropdown set to "Allow"
Close the tab and you are done. You also have the option of turning off pop-up blocking when you hit step 5 if you so desire. To do so just click the radio button next to "Allow all sites to show pop-ups"
Choose the Turn Off Pop-up Blocker option. 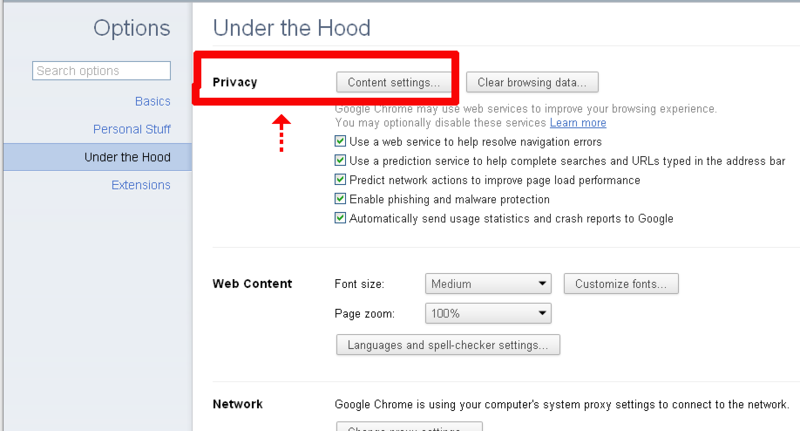 From the Internet Explorer tool-bar, Select Tools menu, from the drop down menu, Select Internet Options then Select the Privacy tab (at the bottom of the Pirvacy window should be a Pop-up Blocker section), Select the Settings button. Select the Add button, then Select the Close button, then Select the OK button. AIM Toolbar is often inadvertently installed along with AOL Instant Messenger, an instant messaging software. This Toolbar provides search functionality and interacts with AOL Instant Messenger. Click on the AIM button on the left end of the Toolbar. This will open the drop-down list. Clicking on the Toolbar Options in the drop-down list will open the "AIM Toolbar Options"
Choose the pop-up Blocker Tab and uncheck the Block pop-up Windows box. Once this is done, the user should be able to open the new window. If you are still unable to log in, you may have more Pop-Blockers to identify and disable. Click Pop-Ups in the Essentials tab. Click Apply and OK to close the options window. In the Web Pop-Ups tab of the Pop-Up Control Settings window select Allow Web pop-ups from these sites. 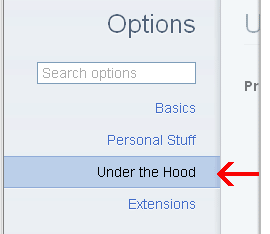 Click the Protection button on the toolbar. Click Pop-Up Blocker then Options. Right-click on the first blank line, then type the full address of the site ( http://www.virtualhrcenter.com/) and then press <Enter> on your keyboard. Click OK to close the list. 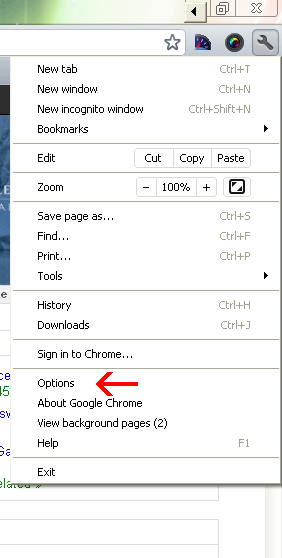 Open the Options window in Firefox. Click on the Web Features icon. Uncheck the Block pop-up Windows option.Click Apply and OK to close the options window. Google toolbar has two ways that you can turn off the pop-up blocker. Open the Google Toolbar Options window by clicking on the options button. Click on the following button on the toolbar. Open the Edit toolbar menu and choose the Preferences option. You can either de-select the box next to Block unrequested pop-up windows to completely disable the pop-up blocking software, or add Virtual HR Center to a list of allowed sites. To do this, click the Allowed Sites... button, type http://www.virtualhrcenter.com into the text field, and then click the Add. Click OK.
An alternative method of doing this is to browse to the Virtual HR Center website (http://www.virtualhrcenter.com), and then click on the Tools toolbar menu. 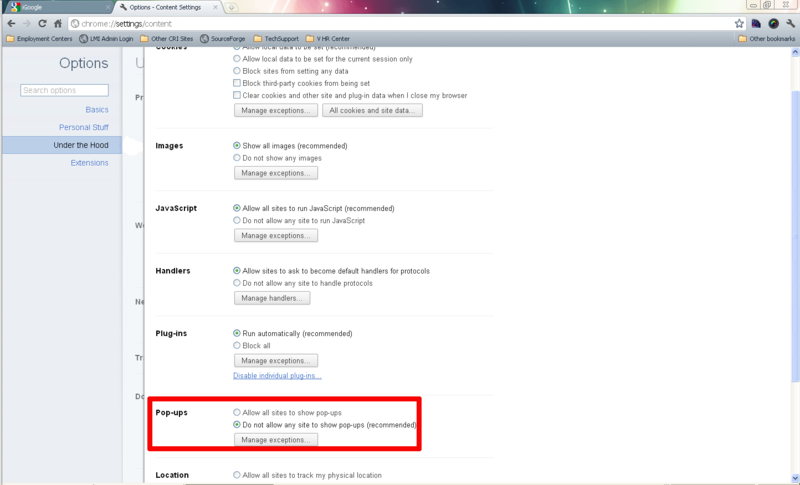 Choose pop-up Manager and then select the Allow Popus From This Site option. McAfee also has a feature that allows the user to hold down the Ctrl key while clicking the refresh button which will allow the pop-up to load. Otherwise, click on Start>Programs>Norton Internet Security>Norton Internet Security. In the left hand pane of the Norton Internet Security window click on Norton AntiSpam. Choose the Status and Settings view under Norton AntiSpam. If Settings for Pop-up Blocking display a green checkmark, then Turn Off Pop-up Blocking. To do this, Click on the words Pop-up Blocking. Click Pop-Ups Blocking -> Turn off. The last step is to clear your Cache. To do this you can open Tools >Internet Options > click the "Delete Files..." button OR from the assessment page, while simultaneously holding down the Ctrl key & the Shift key use your mouse to press the browsers refresh button. Remember that the last step after turning off Norton Internet Security's pop-up blocker is to to either delete your Cache or to Refresh the assessment page while simultaneously holding down the Ctrl & Shift keys to open a non-cached copy of the assessment page. In the left hand pane of the Norton Internet Security window choose the Status and Settings view under Norton Internet Security. If Settings for Ad Blocking display a green checkmark, then Turn Off Ad Blocking. To do this, Click on the words Ad Blocking. The Ad Blocking Pane should appear in the right hand pane. Click on Disable pop-upCop. Once this is done, the user should be able to open the new window. If you are still unable to log in, you may have more Pop-Blockers to identify and disable. In the resulting drop-down menu, select the option to Allow pop-ups from http://www.virtualhrcenter.com. Note: In order to enable pop-ups on an individual basis, press the Ctrl key while clicking on whatever is initiating the desired pop-up window. Un-check the checkbox next to Enable pop-up blocking. You can re-enable the software when you are done with your assessment. To allow pop-ups from the Virtual HR Center, launch a new Internet Explorer browser window and navigate to http://www.virtualhrcenter.com. Once you are on the Virtual HR Center home page, click on the pop-up Blocker button in the Starware Toolbar. Once you do, the toolbar button will change to indicate that pop-ups will now be allowed from the Virtual HR Center. To completely disable the pop-up blocker, click on the arrow next to the Starware logo on the left-hand end of the toolbar. This will display the main menu; select the Preferences... option from the resulting drop-down list. In the message window that appears, uncheck the box to Enable pop-up Blocker. Click OK to close the window. Viewpoint Toolbar is often inadvertently installed along with Viewpoint Player, a media player software. This Toolbar provides search functionality and shows snapshots of search results' pages. Clicking on the word Viewpoint on the right end of the Toolbar will open the drop-down list. Clicking on the Options Menu in the drop-down list will open the "Viewpoint Toolbar Options". 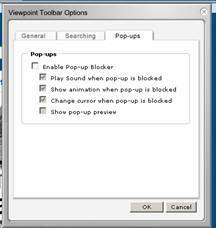 To disable Pop-up Blocking choose the Pop-ups Tab and uncheck the Enable Pop-up Blocker box. Then click the OK button. Uncheck the entry Enable Pop-Up Blocker. Once this is done, the user should be able to open the assessment window. If you are still unable to log in, you may have more Pop-Blockers to identify and disable. Open the Zone Alarm program by clicking your Start Button and accessing the Zone Alarm folder under Programs. Turn off Cookie Control, Mobile Code and Pop Up control.